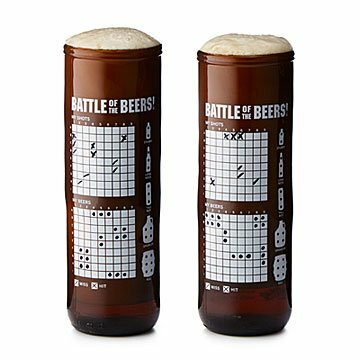 Play (and drink) round after round with this handcrafted beer glass featuring a battleship grid. Sure, beer pong's all about sinking cups, but why not switch it up and sink some ships? We've all got that friend who's still a kid at heart (but also enjoys a hoppy IPA now and again). This battleship-meets-beer-glass invention was pretty much made for them. Handcrafted out of upcycled glass by a beer-loving husband and wife duo in Canada, it's ready for round after round after round. Oh, and the marker's included, too. Cheers to that. Dishwasher-safe. Handmade in Haliburton Highlands, Canada by Terry Craig and Jennifer Wanless-Craig.